Sonos stock closed 2018 down roughly 34.5% from its initial public offering price. Shares of Sonos (NASDAQ:SONO) dipped 20% in December, according to data from S&P Global Market Intelligence. 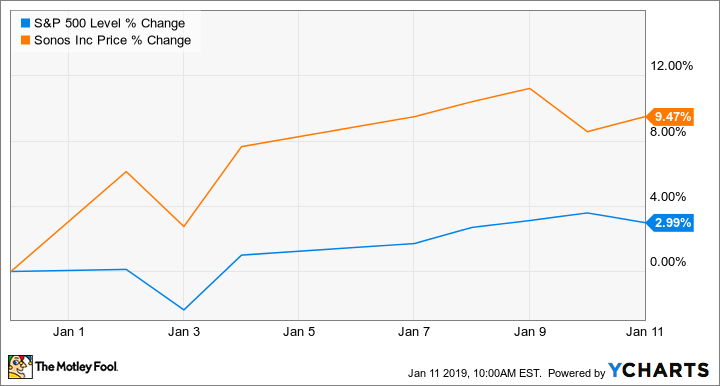 The big monthly decline for the speaker hardware company came after shares hit a new lifetime low amid a period of steep sell-offs for the broader market. Sonos had its initial public offering in August and priced shares at $15 for its market debut. The stock gained ground in its first month of trading but has since declined amid market volatility and increased concerns about the company's competitive position in smart speakers. Sonos posted strong sales growth (up 27% year over year) when it published fourth-quarter earnings in November, but guidance was uninspiring, and the stock traded sideways in the month before going on to track well below the broader market in December. The company's products are generally highly regarded, but tech hardware is a historically cutthroat industry, and tough competition has some investors questioning the company's long-term outlook. 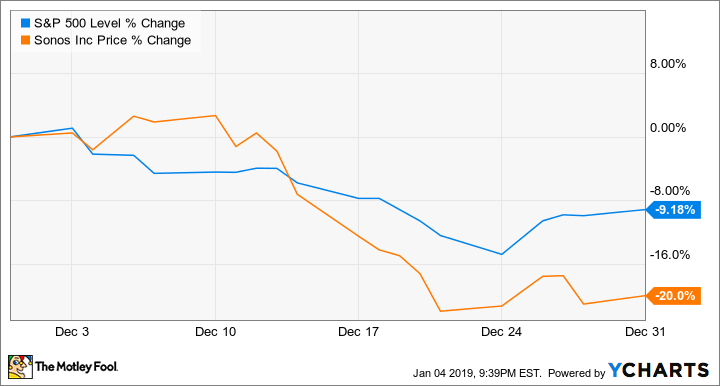 With stocks undergoing dramatic sell-offs in December and Sonos' business yet to achieve consistent profitability, it's not surprising that the speaker company lagged the market last month. Sonos stock has seen some recovery along with the broader market, with shares gaining roughly 9.5% in January so far. Sonos recently launched new accessory products in its online store, a notable move because it evidences the company's push to build its status as a lifestyle brand. Tech giants including Apple, Amazon, and Alphabet also compete in the smart-speaker space and enjoy superior software and ecosystem tie-ins, and as with products like phones and televisions, budget-priced offerings from a range of players tend to improve their value propositions over time and decrease profitability in the overall market. Sonos has a high-quality line of products and could thrive if it can rely on brand strength to alleviate competitive pressures, but it remains to be seen how that will play out.